Home / Blog / Can I Get a Recommendation From an Out-of-State Doctor? More than half the states in the U.S. have legalized marijuana for medicinal use. However, because it’s still considered an illegal substance by the federal government, each state has different legislation and qualifications patients must meet. A common thread among all states is the doctor recommendation. All medically-legal states require patients have a doctor recommend the use of medical marijuana for their condition. In most states, the doctor must also be licensed with the state where you are applying for your card — meaning you can’t receive a recommendation from an out-of-state doctor. Unfortunately, each state has different criteria for who can be your recommending physician. So, it’s crucial to research your individual state to see what requirements your doctor must meet before they can recommend medical marijuana. 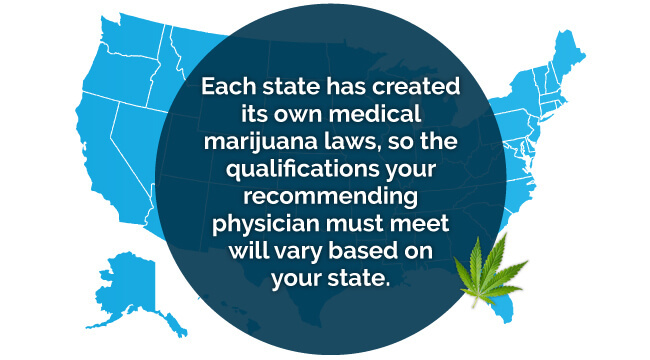 Each state has created its own medical marijuana laws, so the qualifications your recommending physician must meet will vary based on your state. Some states are more laid-back, allowing any licensed physician to recommend cannabis. Others, however, require doctors to undergo specialized training and receive a certification before they can recommend. Almost all medically-legal states require patients have a bona fide relationship with a physician before they can apply for the program. Some only require the doctor to meet with you once, and then take responsibility for any follow-up care. Other states are more stringent, requiring an established relationship of at least several months. Be sure to brush up on your state’s requirements before making an appointment to receive a recommendation. If your doctor lives out of state, they most likely won’t be able to prescribe medical marijuana, according to the legislation of most legal states. Search our user-friendly database to find a doctor near you and start establishing a cooperative relationship. You may even be able to find some telemedicine options, so you can receive your medical marijuana recommendation without having to leave your home.